Handlebar Upgrades on your Harley! Shore Cycles is excited to offer great prices and service for handlebar upgrades on your Harley. Currently we do cable-operated handlebar upgrades on all modern Harley Davidson motorcycles. We have the best brand available like Burly Brand, Barnett, Kuryakyn, Performance Machine, Wild Ones, and more. Here are some things to keep in mind when getting handlebars done. Make sure the bars fit your bike! This sounds like an easy one, but many narrow apes won’t work on a bagger, and many bagger bars won’t have the right ergo’s or looks on a Dyna. Do you need dimples on your bars? Does your wiring run inside your bars; if so do the bars have openings for this? Changing bars is a great time to change risers, and sometimes necessary for the right look and setup. Make sure risers work with both the bars and your bike. For that extra heightened look, we’d recommend going with a taller bar with a shorter riser; that way you get more bar without too much height! Arguably the most important part of a handlebar job. MEASURE, MEASURE, MEASURE. Remember, you must factor in any and all changes to your setup, including: bar height, riser height, pullback, width, and many more factors. This is also a good time to upgrade your cables to something stronger and longer lasting. A handlebar job is the perfect time to change your grips! Sometimes, we have to change grips if your last ones were glued on or are really worn out. There is no extra labor for getting new grips during a handlebar job. Kuryakyn and Performance Machine make some really nice and functional options. For some jobs, you’re going to need a wiring extension kit. Many Harley’s come with plenty of extra wiring bundled up under the tank, but don’t assume that you have enough wiring! We always recommend having a wiring extension kit on-hand and budgeted into the job, simply because you may need just a few extra wires or connectors to make the job happen. While this a good summary of most handlebar jobs, every bike can be different and your needs may differ from this list. Even with lots of due-diligence, handlebar jobs can be unpredictable. We recommend having patience and flexibility with regards to the job. We offer professional handlebar installation at Shore Cycles. Give us a call soon to discuss your job: 443-291-3030. It's great to be back in the shop after the holidays. We hope you enjoyed spending time with family and friends, and got to squeeze in some riding time too! Anyway, we just got some awesome new off road stuff. Here's the top 5 items! Just added to the Shore Cycles SSR line-up for 2018 is the SSR 140cc TR pit bike. It's the perfect machine if you're looking for a machine bigger than a standard pit bike, but smaller or more affordable than a full size dirt bike. Features include adjustable inverted forks, 14" front and 12" rear wheels, oil cooler, larger disc brakes, responsive race throttle setup, larger 26mm Mikuni race carburetor, and a taller 32" seat height. Our price is just $1899, and includes ALL freight and setup charges! Come take one home today. SSR 110cc featuring pink spoke wraps. Spoke wraps offer a fun and easy way to customize your bike with a pop of color! They wrap around any dirt bike spokes, and are extremely durable. Return of the $19.99 Goggle! We got a limited supply of Fly off road goggles in TONS of colors, both youth and adult sizes available. Only $19.95 to protect your eyes from branches, dirt, and gravel!! Cool pics, deals, event info, featured bikes, and behind-the-scenes. Sooo it's getting colder out, but that doesn't mean you have to stop riding! To help you extend your riding season, we just got some great new products for Motorcycle and ATV riders alike. Whether you're carving corners on the weekends on your street bike, or out early on the trail headed to your dear stand on your ATV, we've got stuff to make your ride easier and more enjoyable! We're super excited to welcome Scorpion to Shore Cycles through our distributor Wester Power Sports. The first item we have from them is the super popular Scorpion Covert! This is definitely the most unique helmet we've ever seen on the market. It has a 3-in-1 design, allowing the helmet to be a full face, 3/4 open face, or half helmet, all within seconds! 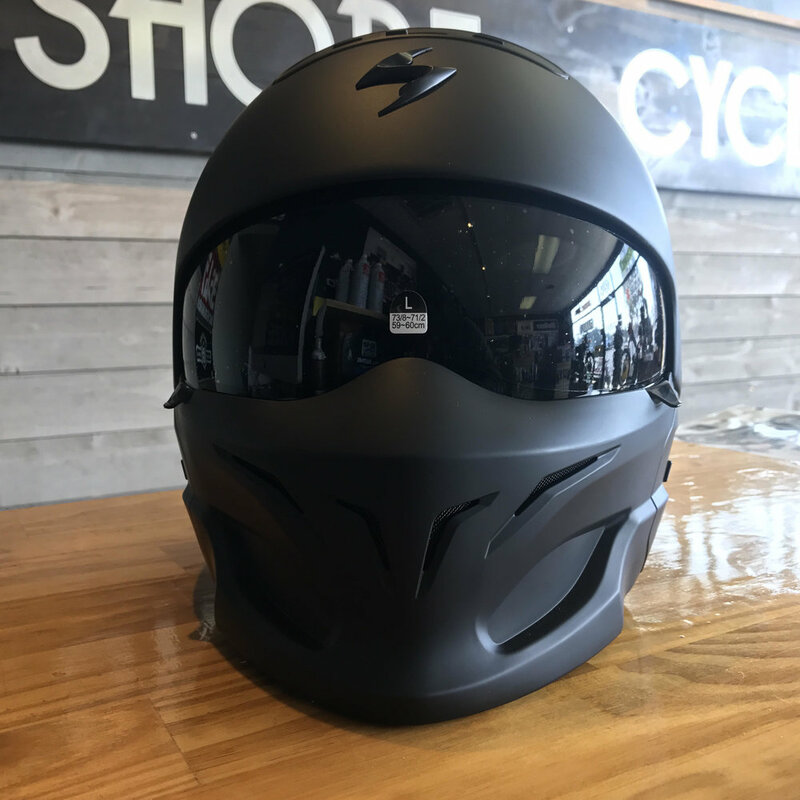 Some of the technical features include an LG lightweight polycarbonate shell, aero-tuned ventilation system, drop-down sun shield that integrates directly with the jaw for quiet rides, KwikWick II moisture-wicking liner technology, DOT approval, and a FIVE YEAR WARRANTY!!! XS-3X available NOW at Shore Cycles. Your hands need protection from cold weather so they can stay flexible and responsive to operate the brakes and throttle safely. Luckily, FLY makes the super warm Aurora glove specifically tailored for riders. It features a HIPORA waterproof liner, full gauntlet, leather palm, TOUCH SCREEN compatibility, 115g of Thinsulate, padded knuckle protectors, and reflective piping for safety. These gloves are SUPER comfy. They have a soft neoprene liner for comfort even on those super cold commuting days. The gauntlet is perfect for keeping wind and raining out of your jacket. Unlike basic winter gloves, these have a pre-curved race fit in the fingers, so it's much easier top operate your throttle, brakes, clutch, and switches. Utility ATVs, are all about one thing: UTILITY! Increase your ATVs ability with the durable V-tek holders by ATK-TEK. These holders have Variable Fit Technology (VFT), so they can hold rifles, bows, farming equipment, snow shovels, and SO much more. Adjustment and mounting is effortless thanks to the too-free process, and you can place these on just about any normal ATV handlebar or rack tube. Forget about trying to hold your hunting or farming equipment while riding! These V-Tek holders will secure your equipment safely and within easy reach. 10% off any gear in this blog post! Expires 11/30/17. Show this post on your phone to get discount. Limit one discount per customer. Many of us know Keanu Reeves as a down to earth person who rides the metro rail like an every day individual. We’ve seen most of his action packed movies, observed his obsession with defense weapons, but not most know nothing of his latest creation. Coming out with his latest film project, John Wick: Chapter 2, Keanu Reeves has been in an out of the film studio. However, in the midst of his acting career, and him riding the metro rail, Keanu Reeves has become an innovator in the motorcycle cruiser world. Keanu Reeves and his counterpart have challenged the motorcycle industry by creating a custom S&S V-Twin with an aggressive and maneuverable frame. Keanu Reeves and co-founder Gard Hollinger seem to be pushing their motorcycle culture and values in a direction where some feel the bike should be in its own class all together. Gard Hollinger, a master builder of motorcycles, is known primarily for his L.A. County Choprods shop which focuses on custom creations of motorcycles and after markets parts. Luck had it that the initial prototype of the KRGT-1 was to be created there after Reeves approached Hollinger for custom work on his V-twin Harley-Davidson Dyna for a custom built sissy bar. Hollinhger, the master builder he is built a modern but throw back custom motorcycle with an aggressive build. Through this, the spawn of the KRGT-1 custom motorcycle was conceived which evolved into the KRGT-1 and the start of Arch Motorcycle Company. The extra travel in the rear suspension allows for heavy cornering unlike other cruisers. the look is not far from a cafe rider. Once a KRGT-1 is designed it takes over 300 machine hours using their CNC and water-jet machinery to create each individual masterpiece. The KRGT-1 stunts over 200 custom made parts created at the ARCH manufacturing facility in Hawthorne, Calif. Additional more standard parts are supplied by vendors who collaborate or havethe same fit for ARCH Motorcycle Company parts. Consequently, in a good way, the KRGT-1 has started a debate whether or not its is in its own category of motorcycle or its just a more modern cruiser. The KRGT’s aggressive stance, sport like maneuverability in corners (due to more travel in the rear suspension), and V-Twin power allows this “cruiser” to categorize itself in a whole new class. As for pricing, the bike does not come cheap. Nor does the price appeal to any unprofessional. However, ARCHs retro cruiser is delivered worldwide through their own delivery service and is provided with a 2 year warranty. Now your 200 custom components and 300 plus manufactured KRGT-1 will cost you a whooping $78,000 USD. With that being said, you can breath, if you can afford the payment plan of $15,000 downpayment, the $20,000 after design choices have been made, and then forking over the remains $43,000 upon delivery. Reluctant to buy due to the price, I can still however thank Keanu Reeves for creating somethingchallenging that we can all appreciate. Years of development and thousands of miles of testing provide KRGT-1 owners with a level of comfort and confidence rarely experienced in exotic transportation. Stunning appearance and performance is the bonus. HIGH-OUTPUT LED HEADLAMP W/ INTEGRATED HIGH BEAM, LOW BEAM. MOTOGADGET BAR END LED FRONT TURN SIGNALS. ARCH Motorcycle Company begins production of the highly anticipated KRGT-1 and is now accepting reservations. The growing popularity of smaller motorcycles has caused manufacturers to shift from only making the biggest and badest bikes to making small, inexpensive machines that pack a punch. The most recent batches of 300cc motorcycles are often equipped with ABS, clip-on handle bars, sportbike seating positions, inverted forks all while achieving 60 plus miles to the gallon. These bikes start around $5,000 brand new. Of course naturally, with the rise in popularity of small sportbikes a new ultra-lightweight racing class has sprung up. For the last few years, Moto-America has had a Factory spec racing class that featured the KTM-390 and World SuperBike has just announced their new small engined racing series. MotoAmerica's KTM-390 cup series will be the best racing you will ever see. Each bike featured in the races are almost exactly the same, so winning one of these races is 100% the riders responsibility. There is no mechanic, factory team, or amount of money you can spend to give yourself a competitive advantage. Many of these races you will see bikes in packs of 5-10 within inches from each other, all fighting for the win. Some of these races feature less than .5 second gap between the winner and the top pack of riders. Not only does this racing class require the "rider" mod to be the most important, but it is also by far the most affordable class to race. Take a look at some of the racing forums for a used 300cc race bike. For 3-5k you can buy a full blown race bike that is capable of winning championships. Oh, and once you learn how to make one of these bikes go fast, imagine how fast you will be once you jump on something like an R1. Small bikes are the cheapest way to get into racing and the best bikes to learn on. 1) Ram Mount for cell phones. This device is the best cell phone mount out there. This mount can be attached via stem mount or to the handle bars. Ram Mount features two different points of restraint on your cell phone to ensure it stays in place while you ride. The 4-point X-Grip clinches the phone while a rubber strap grabs all four corners of the phone to prevent it from dislodging from the X-Grip in rugged terrain. This bracket easily attaches to the swing arm of a motorcycle. With this device and a Bike master integrated taillight you can legally remove the big ugly tail fender on your street bike. These two products will give your bike a cleaner and sleeker looking tail. Do you know someone who likes to ride in the winter? With these two apparel items, the cold won’t be a problem for their hands or face. Fly Xplore Gloves are water proof, are thermally insulated, reflective, have a breathable membrane and will also provide protection form an impact. The Neoprene facemask blocks frigid air from making contact with a riders face. Plus, they come in all black or a glow-in-he dark skull face. For a small price you can enhance the look of a motorcycle helmet and shade a set eyes form the sun. These visors are easy to install and are available for almost any full face helmet. Help someone you know represent the brand they are forever loyal to. We have sticker sheets for the big four manufacturers. These include Yamaha, Honda, Suzuki, and Kawasaki. Under heavy braking or when a rider is crouched over the tank to stay hidden form the wind, pressure gets put on the tank. Prevent scratching of the tank tank by putting one of these on it. Not to mention, they look mean and make a bike look a little more aggressive. Looking to purchase a gift for the off-roading enthusiast close to you? Look no further because Shore Cycles has everything they need for them to properly maintain their machine. These products are necessary for any off-roader. Without these small additives a bike will not run properly. Below is a list of products that are perfect to add to a dirt riders gift list. The Air filter on an off-road machine acts as the lungs. The Air filter prevents dirt, rocks, mud and dust from reaching the combustion chamber. The Filter becomes blocked up after a few rides. Bel Ray Filter Oil allows for quick cleaning and maintenance of an air filter. Without these products, your bike will not run properly and harm can be caused to the engine. Bel Ray comes in three grades. These are Mineral, semi-synthetic and full synthetic. SeaFoam engine treatment is an additive that can be put directly into the gas tank or sprayed into the air intake. While this product travels through the fuel line it cleans out the injectors, cleans the carburetor jets, eliminates deposits, removes moisture and lubricates the cylinders. Cleaning out the fuel line allows for the engine to receive the proper amount of gas by helping it flow freely. The chain on a bike bounces and twists for the duration of a ride. It undergoes a massive amount of force as it transfers power from the engine to the drive wheel(s). Once a chain dry’s up or dirty it seizes. When the chain is not properly lubricated it makes it difficult for the engine to transfer power, causes damage to the sprockets and the chain can even break. (you really do not want your chain to break while you are in the middle of the woods) Make sure you buy the right equipment to maintain your chain. Most off road vehicles have very small battery’s so they have a limited amount of times they can be started. During the colder month’s battery’s lose their ability to maintain a full charge. This charger can be hooked up to a battery and left on for extended period of time. The device will charge the battery until it is fully charged and will not overcharge it. The slow sharing of the battery helps extend the battery life.